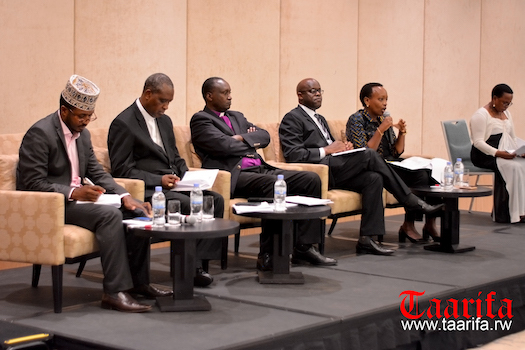 The ministry of gender and family promotion (MIGEPROF) and religious leaders gathered on Tuesday to discuss issues threatening Rwandan family as a the smallest unit of society. Islamic, Catholic and Pentecostal church leaders concurred with government officials that family values are diminishing and the Rwandan society faces dire consequences if nothing is done to address the ills. The minister recognised the role of religious leaders in preaching reconciliation in the post genocide society, lauding their continued promotion of family values. Nyirasafari however indicated that threats to family are growing, citing among others, teenage pregnancies, child labor, human trafficking and parents shunning their responsibilities. “These issues don’t require support from donors, it is just a change of attitudes”, she advised. “With the problems we see in our families, we join efforts to make sure that our children are back to school, with national positive values, to make sure that gender based violence in defeated in our marriages, make sure that people who are getting married are not divorcing the next day,” he added. The clergymen urged government to support some of their initiatives to fight the increasing moral decadence in society, pointing out pronography and faling marriages. However, Anglican Bishop, Alex Birindabagabo, pointed out drug abuse as the root cause of the prevailing social ills, suggesting that if fully handled, other consequences will be minimal. Birindabagabo call upon religious leaders to ask their followers to adopt street children into their families to solve the issue. The permanent secretary in MIGEPROF, Umutoni Gatsinzi Nadine, emphasised “umugoroba w’ababyeyi” as one of the major government program that can contribute greatly as a platform for social debate in cracking down delinquent behaviors, and resolving conflicts amicably. Umugoroba w’ababyeyi (Parents’ evening), is a neighborhood open discussion platform started in 2010 to collectively promote family values. Both government officials and religious leaders resolved to establish a platform in which continuous social debates on societal issues will be ironed out, among others.